"PC" is the leading personal computer magazine in Serbia, targeting mainly IT professionals. It began, as the first privately owned computer magazine in Yugoslavia, in April 1995. Within first years, it grew and established a wide circulation, with a large number of regular subscribers. "PC" is considered an important source of information for all those choosing, buying or setting-up computer systems. The magazine hits the newsstands on the 1st of each month - each issue has approximately 160 pages, printed to highest technical standards. The magazine is divided into sections, which feature news, market analyses, hardware and software review, communications, Internet, technology, trends, and productivity hints. Articles written by recognized authors, apart from giving useful information, offers an interesting reading. The Editor-in-Chief of the magazine is Dejan Ristanovic. The Editor is Voja Gasic, the Executive Editor is Bojan Stanojevic, and the Online Content Editor is Jovana Milicevic. The list of contributing editors include some of the best known computer experts in Serbia, people with years of experience both in IT industry and journalism. 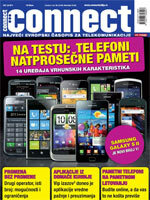 PC Press company also publish connect, the Serbian edition of the leading european magazine for telecommunications, and operates the pcpress.rs Web portal. PC Press company publish special editions, books and CD/DVD ROMs. PC Press was the first company in Yugoslavia to follow-up the launch of Windows 95 with a book - "PC 95", and also to follow-up the arrival of Internet in Yugoslavia, with a book and CD-ROM - "Internet". During 1997 and 1998 we published two SezamFile collections of public domain software on CD-ROMs, and also five DVD editions of our magazine (full text and illustrations of the previous issues, in PDF and HTML format). Part of that material is available on this Web site. The simplest and most effective way to market your products in Serbia is to place an advertisement in our magazine and to have your hardware or software reviewed by our editors. IT professionals who decide about purchasing computer systems, and also those who later set-up and use the equipment, read "PC". The magazine is selling throughout the country, and the part of the circulation is distributed to the republics of former Yugoslavia, FYR Macedonia and Bosnia and Hercegovina. A great number of subscribers, mainly companies, guarantee that the messages from the magazine get to the hands of people who are professionally in computer business. Eminent authors, great respect on the market, huge number of subscribers, high-quality printing and modern design have attracted many advertisers, so "PC" became the magazine with the greatest number of commercial advertisements per issue. We have the confidence of Serbian, as well as of many international companies with the highest esteem, advertising in our magazine directly, or via their distributors. Reservation must be till 5th in month, for next month issue. Advertising material is to be delivered by 12th of the month, for next month issue. 20% discount for the year contract and pay in advance. 10% discount for the half year contract and pay in advance. All prices are in EURO without tax DTP expenses.